I still have to catch up with some of the group's recipes I tweaked during Lenten season. As everybody was so excited about the Dulche de Leche Duos and I was so excited about the possibility of making it yourself I went for it some weeks ago. 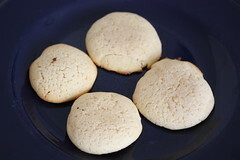 I didn't find enough time to bake the cookies themselves, but the DDLcan be stored for up to two month. Well, I didn't wait that long. But recently I got fed up with having a bowl of DDL in my fridge. I need the space. I need the bowl. I don't like to have left-overs for a long time. (I am still kind of in "lenten-mode": Before Easter, I start cleaning my stocks and cupboards). So. 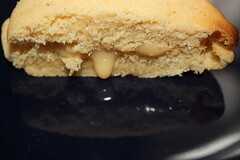 Dulche de Leche Duos. Honestly, during making them I constantly thought "Never. Again. Ne-ver". My kitchen was a mess. I had a hard time measuring the needed amount of DDL. Additionally, I was not well prepared. When I was ready to measure out the needed flour, I already had the DDL in my cup-measure, so I couldn't use it anymore. When I was ready to toss in the baking soda, I found out that I ran out of it. When I had mixed the dry ingredients in the only bowl actually available in my kitchen, I saw that I would have needed this one for beating the butter. I needed three tours for baking away all the batter (and I even made only the half amount), because I have only one baking sheet. So it took much longer to make the cookies than planed. And I thought about the long, long time for baking the DDL. I have no quick or rice cooker, condensed milk doesn't come in cans in Austria, and I know only one store where they sell DDL. An extremely, extremely high-end pricey shop. So, doing it myself the David-Labovitz-way was the only option. But once they cooled down, and I tried a cookie, I was taken. Still, I am not sure if I will do them again because I know me - I am a lazy little person. But I hope when Christmas time comes, I remember how tasty these little caramel cookies are, and that they are a welcome change to all the chocolate and gingerbread. I can also imagine them to be a wonderful base for icecream-sandwich. Mabye with some caramel icecream? And that brings me to the other topic today - the May-TWD-preview is here!! Spike of spikebakes decided on the Banana Coconut Ice Cream Pie. I am excited about the Icecream. I love doing icecream since I got "The perfect scoop". I have no machine, but David Lebovitz gives great directions about how to make icrecream by hand. 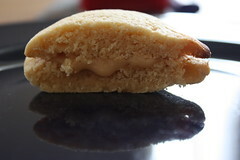 I just decided to fridge some of the Dulche de Leche Duos-cookies and make DDL/Caramel Icecream Sandwiches with them! The Berry Tarte is perfect for the season and I am so much looking forward to buying fresh berries on the market that week. I have some brioche left from the Easter brunch, and planned to used it for a recipe proposed by Isa of Les Gourmandises d'Isa (Apple and Pear Brioche Pudding), but in the very last moment I saw the May preview and the apple-bread pudding is a welcome use for the brioche. But lets see. Maybe I will have a better idea than bringing it to work, because - let's get serious. Icecream, coconut, bananas - I HAVE to try that!